This is the third release from this Australian band from which I must admit I had not heard of until now. They play melodic power metal and do so quite well. I say this even though the minimum standard for "good bands" in this genre is higher now due to the large number of bands playing this style of metal. Do you like Queensryche, Tad Morose, or Iron Maiden? These are the main influences that can be heard in Dungeon's music. OK, now I feel that I must draw a line here after making that statement. Dungeon is not a copy-cat band. They have taken some of my favorite qualities from the aforementioned bands and used them to create a sound that is their own. A Rise To Power features catchy chorus lines enriched by thick harmony vocals ala Tad Morose, extended guitar solos and dual leads ala Maiden, and interesting songwriting in the vein of Queensryche. The songs on this album have up to 30 vocal tracks and 15 guitar tracks which certainly create a thick, rich sound. Well, I guess that may not be so impressive compared to an album like A Night At The Opera by Blind Guardian, but nonetheless, A Rise To Power is very well put together from a musical standpoint. The songs themselves are very powerful and approach speed metal territory throughout most of the album. All the while, the songs maintain a melodic quality, largely thanks to the vocal layering which makes the chorus lines stand out. The drumming is fast and powerful, yet some of the fire is lost with the thin production when it comes to percussion. The drums have a tinny sound and are a mixed a bit too low in volume. This isn't enough to ruin the sound of the album, but with so many of today's bands hitting the nail on the head when producing an album, it is quite easy to tell when an album lacks even a little bit in the production department. Fortunately, the production and mixing is where it needs to be for the rest of the sound. What's up with the black metal song Traumatised at the end of the album? This is a style that just doesn't suit the band very well and sounds especially out of place of hearing 10 tracks of melodic power metal. The trademark thick harmony vocals and uplifting vibe of the song doesn't fit well with the black metal vocals. Strange choice indeed. The Australian release of this album contains two cover songs: Queen of the Ryche (Queensryche) and Wasted Years (Iron Maiden). Both songs stay pretty true to the original and come out very well. I feel both are good choices for Dungeon as Iron Maiden and Queensryche certainly have influenced the sound of Dungeon. A Rise To Power may not be ground breaking material, but as far as power metal goes, this is a very good release. 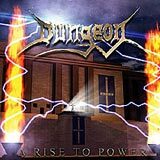 Dungeon manages to rise above the huge pack of the dozens of cookie cutter power metal bands out there. The highlights of this album are certainly the guitars and the vocals (lead and backing). If you like melodic power metal that borders on speed metal, give this album a chance.